Rising prices of certain alloying elements such as nickel and molybdenum have driven recent work on lower priced replacements for austenitic stainless steels. Progress has been made in finding suitable replacements but there are some key open questions remaining regarding the performance of the materials in specific applications. Rising prices of nickel and molybdenum in the past few years have led to unprecedented interest in substitution of leaner-content alloys for standard 300-series austenitic stainless steels in a lot of applications. Due to the high prices of different alloying elements and to periodic large fluctuations that cause similar large fluctuations in the costs of using 300-series stainless steels; a lot of new materials entered the markets in Europe and also in the rest of the world. A big disadvantage consists in the fact that there are a lot of corrosion requirements, however, a direct comparison of the corrosion resistance of these new materials does not exist up to now or only incompletely. In this project comparative investigations were carried out and always one or several representatives of a material group were incorporated. These material groups are: Lean Duplex Stainless Steels, Manganese Alloyed Austenitic and Duplex Stainless Steels and Ferritic Stainless Steels. These materials were investigated in a lot of different test procedures and in different conditions focused on the application in civil engineering and common use. Beside the electrochemical investigations all materials were exposed in different surface states in the atmosphere, once in coastal nearness and once in a city centre area. Other exposition tests with material coupons where done in the atmosphere of indoor swimming pools and at the case of food processing machines were corrosion processes are caused by the cleaning procedure. First results are reported. Lean alloy steels have been developed as a direct response to rising alloy prices and lean alloys are by definition less costly than the higher alloy steels they replace. Alloying with chromium and manganese provides good hardenability and cost effectiveness in both wrought and PM steels. Alloy additions such as chromium and manganese present difficulties when they are used in pre-alloyed water atomized powders due to their high affinity for oxygen. Once formed their oxides are extremely hard to reduce and if the alloy addition is not in solution it does not contribute to the hardenability of the material. A hybrid PM chromium steel alloy based on a 0.85% molybdenum pre-alloyed powder has been shown to have extremely good mechanical properties. While the material may be sintered at 1120°C in a 90 v/o: 10 v/o nitrogen: hydrogen atmosphere, a full 30 minutes are required at that temperature to develop optimum properties and it has been shown that high temperature sintering is more practical in light of the 10 to15 minutes more typically allowed at temperature during commercial sintering practice. A key attribute of this PM chromium steel is the fact that it sinter hardens at conventional sintering furnace cooling rates (about 0.7°C/s) without the need for an addition of copper; something generally needed with many sinter-hardenable materials. The absence of copper improves the robustness of the material – less sensitivity of the dimensional change of the material to density, carbon content, and cooling rate. The high cost of molybdenum in recent years led to the evaluation of hybrid PM chromium steels based on pre-alloyed powders with lower molybdenum contents and a lean version of the material has been developed based on a pre-alloyed powder that contains 0.3% molybdenum. 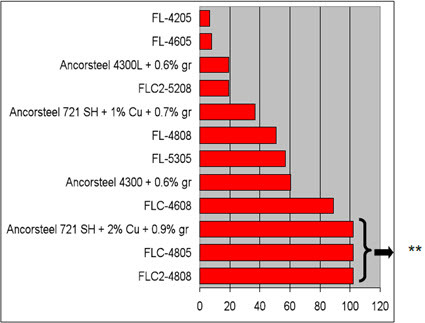 While the hardenability of the hybrid PM chromium steels is lower that of the hybrid sinter-hardenable alloys that contain copper additions, their hardenabilities are comparable to those of other commercial products – Figure 1. The chemical composition of the hybrid PM chromium steel alloys is listed in Table 1, and the effect of cooling rate on the mechanical properties of both of the materials with a 0.6% graphite addition is summarized in Table 2. Table 2:Mechanical properties of the hybrid PM chromium low-alloy steels as a function of cooling rate (cooling rate measured between 650 and 315°C) – graphite addition of 0.6%.For the material that is based on a pre-alloyed powder with 0.85% molybdenum, increasing the cooling rate from 0.7°C/s to 2.2°C/s improved the yield strength by 42%. For the leaner alloy (0.3% Mo), the corresponding improvement in yield strength was 20% for the same change in cooling rate. The yield strength of the leaner alloy is about 80 to 90% that of the other material depending on the cooling rate. The lean alloy has significantly better tensile performance compared with a 4% nickel diffusion-alloyed material (FD-0405) over a range of sintering temperatures – Figure 2. ** These materials had an apparent hardness of > 65 HRA beyond this distance. 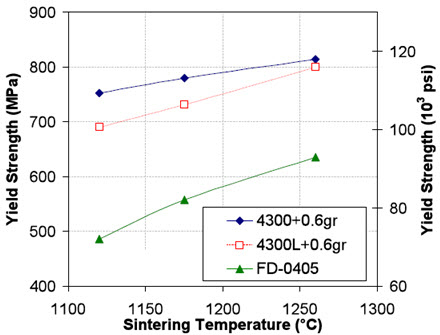 Figure 2:The effect of sintering temperature on the yield strength of two hybrid PM chromium steels and a diffusion-alloyed material (FD-0405). This entry was posted in Corrosion, Stainless Steel, Uncategorized and tagged Lean alloy, Lean alloy steel. Bookmark the permalink.